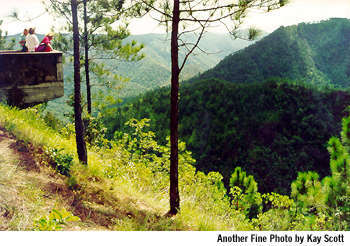 Offering a bit of a respite from the hotter lowlands, Mountain Pine Ridge is one of the most heavily visited reserves. It's a landscape of rolling pine forest spread over smooth granite hillsides, a slightly bizarre area with battalions of uniform pine sporadically dissected by fire breaks and broadleaf gallery forest. Established in 1944, the reserve has been logged on a carefully managed basis ever since. A huge fire in 1949 caused catastrophic damage, and the combination of this and the logging means nearly all the trees are the same age. Not surprisingly, the reserves wildlife is very different from the lowlands. Certainly, birds can be quite hard to see secreted away in the scrub around the pines but there are exceptions. Acorn Woodpeckers are busy around D'Silva Forest Station causing great aggravation by hammering buildings, guttering and telegraph poles. Their habit of storing acorns in tree stumps will be familiar to visitors from North America, but for some reason, the Belizean ones do it as well, even though there's no harsh winter to survive. Other reserve specialities include the Rufous-capped Warbler, Crossbill, Pine Siskin, Stigeon Owl and Eastern Bluebird. If you visit between Autumn and Spring, you may also see the Hepatic Tanager and Chipping Sparrow. Raptors cruise the valleys of the Pine Ridge, and it's the most likely place in Belize to see Orangebreasted Falcons. A special part of the reserve is Baldy Beacon. Speculation continues on the cause of its infertility - soils are so poor they can't even support trees. Instead its covered in grass so tough that when sheep were introduced as an experiment back in the 1960s, they died of indigestion! The most probable explanation for the infertility is that in geological history, while the rest of Central America was under water, protected from the elements, these parts were still above sea level and exposed to erosion and leaching for millions of years longer than anywhere else. The result is a set of rounded grassy hills, with views uninterrupted by any trees. Another different part to Mountain Pine Ridge is the areas that did have limestone deposited on them. These now support broadleaf forest, and the most spectacular example is the Rio Frio caves area, the largest accessible limestone cavern in the country. Walk in a short way, and you can see out both ends. It's light enough you don't need a torch. Back outside, short trails are being developed by the Forest Department, who are in charge of the whole reserve. Also, within its boundaries are the Rio Pools, a popular site for a summer picnic, where the river cascades down into a narrow cavern strewn with granite boulders. It's a great place to spend some time enjoying the deep pools and clambering around the enormous granite rocks. In all areas, a common roadside flower is the yellow flowered St. John's Wort, conspicuous with delicate petals and sets of spike-shaped leaves. Although an adjacent private property, the 1,000 Feet Valley Falls and King Vulture Falls are also reached from Mountain Pine Ridge, capping off the area's attractions. You’ll need a 4WD vehicle to traverse the forest since roads can be daunting. Two roads will get you to MPR: Chiquibul Road from Georgeville or Cristo Rey Road from Santa Elena. Choose the first for a smoother ride. The reserve entrance is off the Western Highway. There are several maps of Mountain Pine Ridge in our maps area. The reserve is not accessible by bus, but can be with a car. Two roads go up there, joining before the reserve entrance, and both from the Western Highway. The main route is the Chiquibul road from Georgeville, starting at Mile 63, six miles east of San Ignacio. The second route is the rougher Cristo Rey road leading directly ovt of Santa Elena. Both tracks wind through orange groves, before climbing up the mountains' northern escarpment. They are rough, and a 4-wheel drive vehicle is recommended, especially in the rainy season when the red clay roads become very slippery. At the reserve entrance there a gate house where you sign in, ad from there road heads up towards D'Silva Forest Station. The Baldy Beacon trail branches off to the left, (from where the 1,000 Feet and King Vulture Falls are also reached). The Rio On Pools are a few miles further on the left. The Rio Frio caves track starts off to the right at D'Silva itself. If you are heading for Caracol, go straight past D'Silva Forest Station to the Guacamallo Bridge. Exploring the Pine Ridge takes a full day. Anytime, although it's fairly wet in the rainy season from July to February. The rain peaks in September and October. It’s wetter from July to February than at other times of the year, so if you are averse to rain, avoid a September/October visit. On the other hand, creatures inhabiting the forest may make up for any dampness or discomfort you experience. You could spot cougars, jaguars, ocelots, crocodiles, magnificent birds and species of frogs and fish living here that won’t be found elsewhere in Belize. Since all of these creatures adore water, chances of spotting them are even better when it rains! All visitors pass into the reserve through its gate house, where you register. There are trails around D'Silva, and with prior permission from the Forest Department (08-22079) you can stay at its basic campsite. There are several resorts in and around the reserve, some of which run kayaking and horse riding trips. 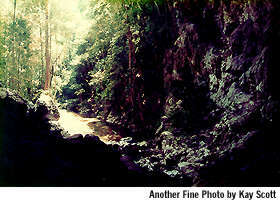 Alternatively the Forest Reserve can be explored on one of the many day tours run from San Ignacio. The reserve is open daily from 8arn to 5pm. Please note though, there is an extremely high fire risk in the dry season, and you must take extra care to avoid any chance of starting fires. The reserve is becoming increasingly popular as a tourist and recreation destination. Informal recreation facilities are provided at the Rio On Pools and Rio Frio Cave, and a campsite at D'Silva Forest Station has been up-graded. The nature trail network in existence since 1989 has been expanded with adjacent trees labelled with both local and scientific names. In addition to these facilities, previous Government initiatives have been made to boost private tourism in the reserve. Visitors to the Mayan site Caracol have to pass through Mountain Pine Ridge. Via the Chiquibul Road and the Cristo Rey Road, both off the Western Highway. The reserve itself is dissected by several roads, tracks, and trails, used for forest management, and some of which are open to visitors. Little is known of the area's early history. It appears Hooper's visit (1887) was the first by a forester, when the site was still known as the Great South Pine Ridge. Hummel (1921) in a report which is regarded as the standard work on the forests of Belize, makes no specific reference to the area, despite the fact that logging was already taking place in the adjacent Chiquibul, which could only be reached through Mountain Pine Ridge. The reserve was designated in October 1944 as a protection forest covering 1504W acres (SR & 0 56). Fire control was introduced the next year, but practically the whole area was burnt in 1949, demonstrating the inadequacy of the management infrastructure as it stood. Most of the older pine of the new generation dates apparently from this event. It was re-classified a production forest in 1952, and impressive advances were made in infrastructure provision (e.g. airstrip 1954), fire control and road building. For the first time, with improvements in the Augustine to Cayo road, timber could be shipped out of the reserve all year round. It is probably true to say that the work done in the 1950s ... marks the zenith of the FD's achievements over the years'. An enumeration of the granite basin was carried out in 1953 and in 1955 the first long term felling license was issued In 1956 a Working Plan was drawn up for the whole reserve. During the 1950s there were a number of revisions made to the reserve area, these being the result of progressively more accurate mapping. In May 1959 the reserve boundary was completely redefined in accordance with recommendations, when the reserve was adjusted to better match geographic and administrative boundaries (FD 1959, para. 8). 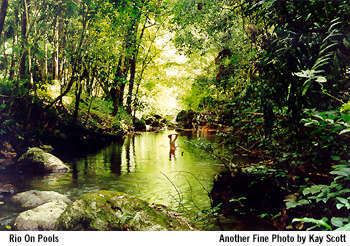 At this time, its area became 132534 (the area lost becoming part of the Sibun Forest Reserve). An excision of 1408 acres was made in 1965 to provide space for tourist developments, but this only seems to have resulted in a new SI in 1977 (SI 49) when the reserve area was reduced to 127203 acres. Subsequently 840 acres were leased to farmers from San Antonio in 1990. This latter boundary change has not been formalized by statute. 650 acres (presumably the same land) are now being used by the San Antonio Grain Growers Association. A hunting ban has been imposed in the reserve since 1978. While part of the reserve boundary is defined by unambiguous natural features, the rest is defined using un- surveyed properties, based on the small scale National Property Map, and this leads -to impressions. Significant areas have been leased out but not all are surveyed so the area of Forest Reserve left is somewhat conjectural. The current SI estimates the reserve to be 127203 acres. The more accurate GIS estimate is 126825 acres. Both overestimate the extent of the reserve remaining on the ground. Originally, the reserve was declared to protect natural pine forests from fire, grazing and cultivation and to secure natural regeneration. Other considerations were the management and conservation of the forest and the conservation of soil and water resources. In the 1970s, its nature conservation function. was recognized, and in the contemporary management approach, designation also enables controlled access to important recreation sites. Subtropical Lower Montane wet to the west and south, and Subtropical Lower Montane Moist to the north and east. The reserve consists of pine (58.5%), broadleaf forest (36.8%), open grassland (3.4%), wetland (0.6%) with the remainder being taken up by roads, rivers etc. There has been a decline in Morelet's Crocodile due to hunting pressure. The reserve falls within the range of the endemic frog Rana juliani, restricted to the Maya Mountains, and a second frog endemic Eleutherodactylus sandersoni is reported along with an endemic fish species Poecilia teresae (known from the upper reaches of Belize River, the Macal and Raspaculo). The only sizeable permanent settlement in the reserve is D'Silva (formerly known as Augustine) forest station (population 268), the administrative headquarters of the FD Western Division. Its growth rate has declined over recent decades with the tendency for families to re-locate to San Ignacio and Santa Elena, leaving employees to commute on a daily or weekly basis. The logging settlement of San Luis (previous population 103) which was also located in the reserve, 6 miles south of D'Silva, has been abandoned following cessation of timber extraction. San Antonio village is in close proximity to the reserve (population 996), and its farmers are cultivating land within the reserve. The majority of the reserve is on a granite massif, intruded and uplifted into a sedimentary series that now remains as a ring of metamorphics around the granite. Some areas of limestone remain in the west of the reserve as remnants of an extensive plateau that was laid over the granite and metamorphics during periods of higher sea level during the Jurassic. They form typical karstic topography with moderately rough landforms and steep slopes. Sink holes and cave systems are frequent here. The central granite basin displays increasingly broken and rough topography from west to east. The metasediments in the east of the reserve contain very rough topography. The main river which drams north, is the Macal River (it forms the western and southern boundary of the reserve). A number of tributaries join it from the east, including the Rio On, Rio Frio, Privassion Creek, Piviol Creek, and Oak, Bum. 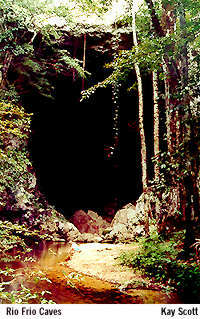 The Rio Frio Cave is a limestone cavern through which the Rio On flows for 76 yards. The Pao On waterfalls area is where the river flows over granite outcrops in a long attractive series of rapids and cascades. 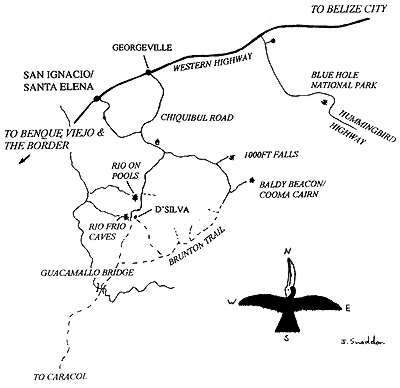 With the exception of a small number of streams in the northeast which flow into Upper Barton Creek, all rivers flow into the Macal River (part of the Belize Rim drainage). Elevation in the reserve ranges between 3336 feet al Baldy Beacon and 394 feet on the Macal River at Black Rock. The central granite block lies al an average of between 1312-2296 feet. Annual rainfall averages 61 inches at D'Silva and 83 inches at Cooma Cairn, distributed unevenly through the year. The dry season generally lasts from about February to May, during which time temperatures can go as high as 102' F and relative . humidity as low as 70% (so this is the time of year when the risk of forest fires Is highest).. Monthly dry season rainfall is less than 4 inches. It peaks during al 9.5 inches in September/October. Mean annual maxima temperatures at D'Silva and Cooma Cairn are 29C and 25C respectively, with mean annual minima of 19C and 17 C. Extremes recorded are 39C and 60C for D'Silva and 36C and 70C for Cooma Cairn. According to average monthly temperatures, January is the coolest month, with a steady rise through the dry season until May and the advent of the wet season. Thereafter temperatures decrease until the January minimum. Prevailing winds are from the east.